Our Future Rooted in Our Past: A Call for Bilingual Volunteers! A Call for Bilingual Volunteers! Below you will find the press release from FamilySearch regarding the Latin American Genealogical Records. The Indexing Project that the Family History Library in Salt Lake City is well underway working on the 1900 US Census, 1871 Canadian Census, 1930 Mexico Census, some individual State Census records from the 1800's, and a German Census records to name just a few. If you haven't volunteered yet, come join the fun and help get the records indexed so that we can all benefit. 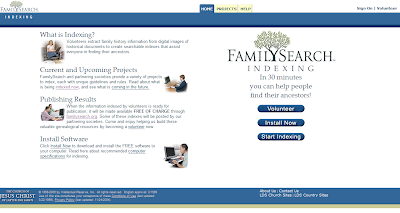 Once the information being indexed is ready for publication, it will be made available for "FREE" on FamilySearch. Indexing is easy and requires only your time (which you determine how much time you can give)and a computer. Below is the press release from The Family History Library and Family Search regarding the request for assistance with the Indexing of millions of Latin American Genealogical Records. SALT LAKE CITY, UTAH—the world's largest repository of genealogical records—is calling for 10,000 volunteers who can read both English and Spanish to help index Mexican, Argentine and other Latin American records for the Internet. The first target is the Mexican census of 1930. People interested in finding their ancestors in that census now have to hunt among 506 rolls of microfilm at a special library. When the project is finished within about one year from now, people with Mexican ancestry will be able to search for relatives easily from their computers at home. "Once indexed, the records are searchable in seconds, just like looking up a name in a phone book—except quicker, easier and online," Nauta said.